Tuesday, February 19, 2019 at 6:30 p.m. – The Penn Book Center hosts Marques Bey in Conversation with Destiny Crocket for the book release event of Bey’s debut collection Them Goon Rules. A series of essays that reads like a critical memoir, this work queries the function and implications of politicized Blackness, Black feminism, and queerness. 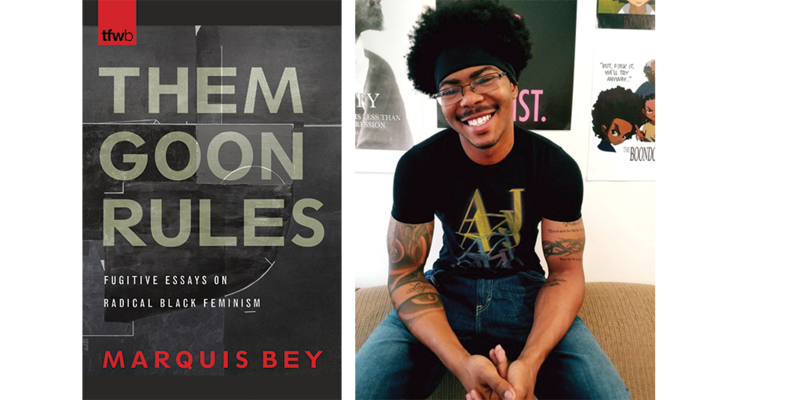 Bey binds together his personal experiences with social justice work at the New York–based Audre Lorde Project, growing up in Philly, and rigorous explorations of the iconoclasm of theorists of Black studies and Black feminism. Bey’s voice recalibrates itself playfully on a dime, creating a collection that tarries in both academic and nonacademic realms. This event is co-sponsored by the Center for Africana Studies at the University of Pennsylvania and the Paul Robeson House & Museum.